From the photo it appears there's a nutrient deficiency. 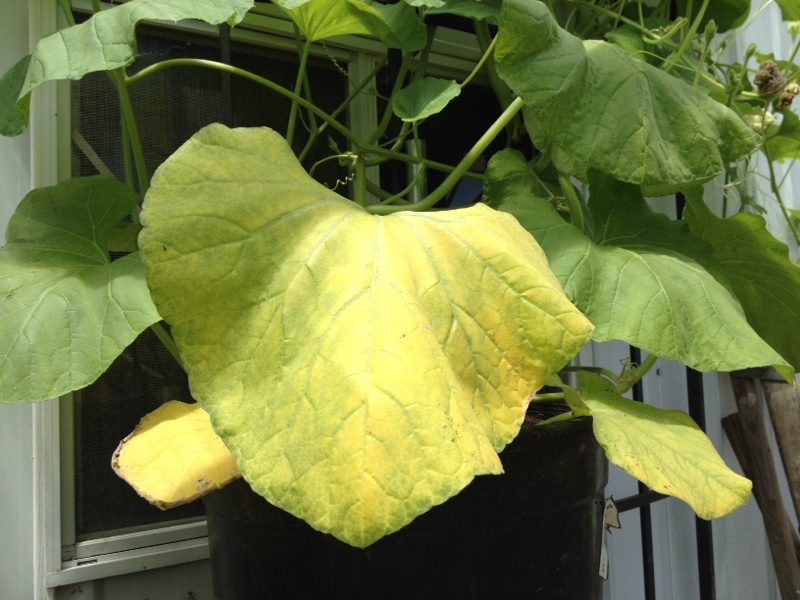 If the plant is growing "in-ground" deficiencies are usually not due to lack of nutrients in the soil (unless you used primarly unfertilized soil amendments or organic matter that hasn't broken down yet), but often nutrient deficiency is caused by over or under-watering for the plants needs. Over-watering can cause the plant to produce vegetative growth rather than flowers, and underwatering is stressful for the plant and it may respond by not producing flowers. In water stressed situations, plant roots either begin to rot or dry out and therefore can't function sufficiently to absorb nutrients along with water and we often see yellow leaves. We recommend watering more deeply and less frequently rather than providing smaller amounts more frequently. If the water does not soak into the soil quickly and begins to runoff before you can provide a sufficient amount, you can apply water until it just begins to runoff, let that water soak in, apply more again until just before runoff, let that soak in, and repeat this several times during one irrigation (in the same day). We recommend keeping the soil evenly moist, and avoiding fluctuations between dry and flooded soils to keep the salts diluted in the moist soil. A time-release fertilizer is also recommended. The are many chewing insect pests, so without seeing the organism itself its very hard to say which may have done the damage. 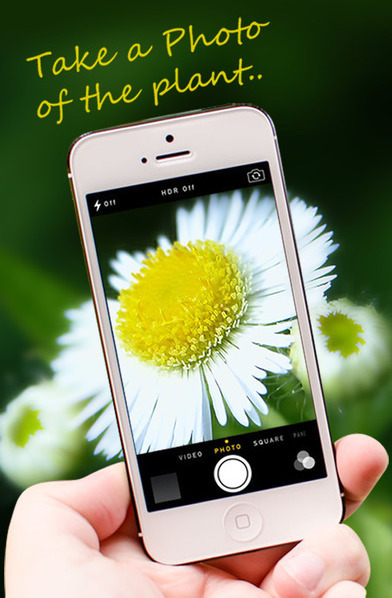 We recommend you examine the plant for beetles and caterpillars, and if you find something please send us a photo of it and we'll be happy to look again. Examine both the upper and lower surfaces of the leaves, and the stems too, at various times of day and in the evening because different insects feed at different times. It may also be that the pest has moved on and won't continue the damage. If you do not see continuous damage, there's nothing to be done. For caterpillar control, products that contain Bacilus thurengiensis or Bt are very effective and least toxic - you can get this at most garden centers, but there's no need for it if caterpillars are not found on the plant. Most beetles, grasshoppers, and other similar flying insects usually don't cause great harm or concern unless there are high numbers of them. If that were to occur, we recommend picking off as many as possible by hand and dropping them in a bucket of soapy water to kill them before disposing of them. You can also ask your local garden center for an appropriate product to be applied after hand-picking. 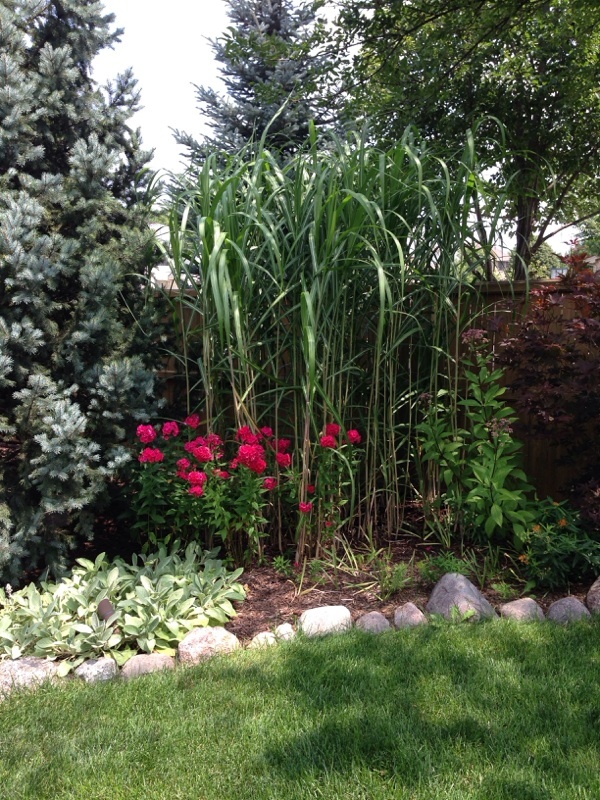 Elephant grass is a tall grass that originally came from Africa in 1913. It grows in dense clumps of up to 10 feet tall. In the savannas of Africa it grows along lake beds and rivers where the soil is rich. African farmers cut the grass for their animals, carrying it home in huge piles on their backs or on carts. 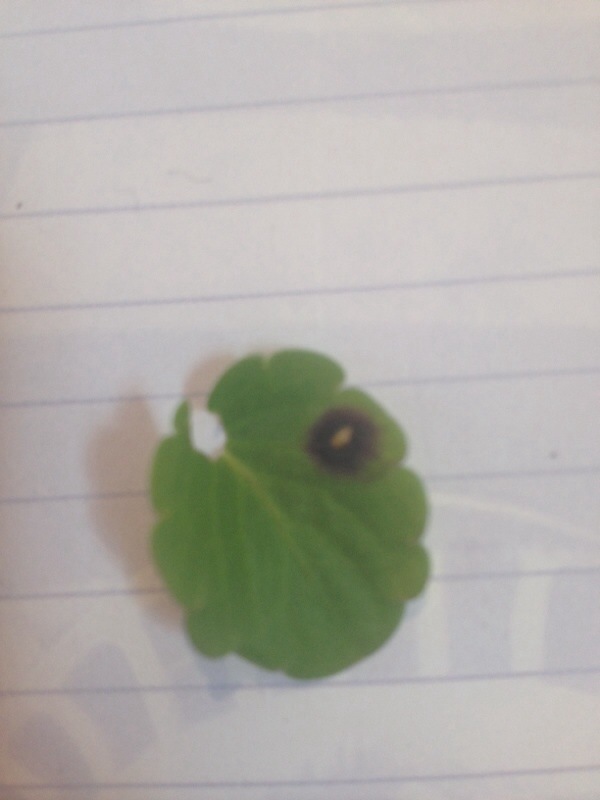 Stems are coarse and hairy, and about 1 inch thick near the base. The leaves are 2 to 3 feet long, pointed at the ends, and about 1 inch wide. 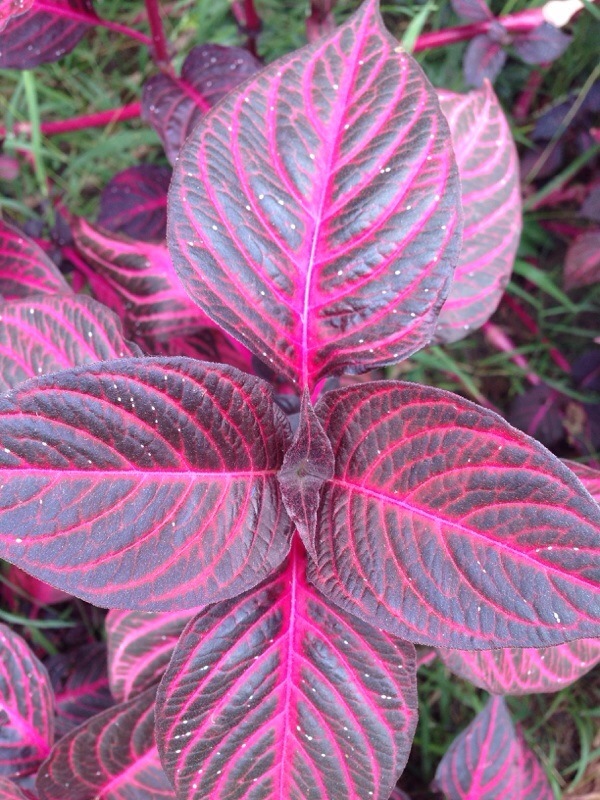 The edges of the leaves are razor-sharp. This makes stands of elephant grass nearly impenetrable. Many bird species make their home in the stands. The dense seed heads of elephant grass are about 9 inch tufted plumes, usually a tawny or purple color. Elephant grass does reproduce sexually, but the seeds are very small and don't germinate well. The grass reproduces mainly through its rhizomes (root-like underground stems that produce roots below and sends up shoots to the surface). Elephant grass can be very invasive and clogs the natural waterways of Florida which have to be cleared periodically. It likes tropical weather and can be killed by a light frost. The underground parts will stay alive if the soil doesn't freeze. However, in the Midwest it is likely considered an annual. Is the entire plant showing these symptoms or only some of the older leaves? If it's the entire plant, or a great deal of the plant, it's likely that it's getting too much water. Pansy leaves yellow if the plant is being kept too wet and plants that are getting splashed with water on a frequent basis are likely to develop leaf-spot fungus. Pluck off the worst of them and destroy, do not compost the leaves. Follow that with a spray and./or soil drench of a fungicide made for flowering annual plants. Sage does best when grown in full sun and watered once a week, fairly deeply. Most plants don't do well if hand-watered or under irrigation where the foliage is splashed with water frequently. If it's only a few leaves that look this way clip them off, and the plant is growing in the ground and not a pot, water the plant deeply only once a week, watering in the morning so that the foliage will dry. If the plant is in a container let it dry out a bit in between waterings - if the nights are cool, for example, you'll only need to water this plant every two or three days. Make sure the pot has an open drainage hole - most plants don't like to grow in pots without a drainage hole. numbers of them. If that were to occur, we recommend picking off as many as possible by hand and dropping them in a bucket of soapy water to kill them before disposing of them. You can also ask your local garden center for an appropriate product to be applied after hand-picking. Chicory is a wildflower often seen along roadsides. Easy to grow and control in the garden when grown as an annual from seed each spring. A bit weedy at times and is more suited for the prairie. 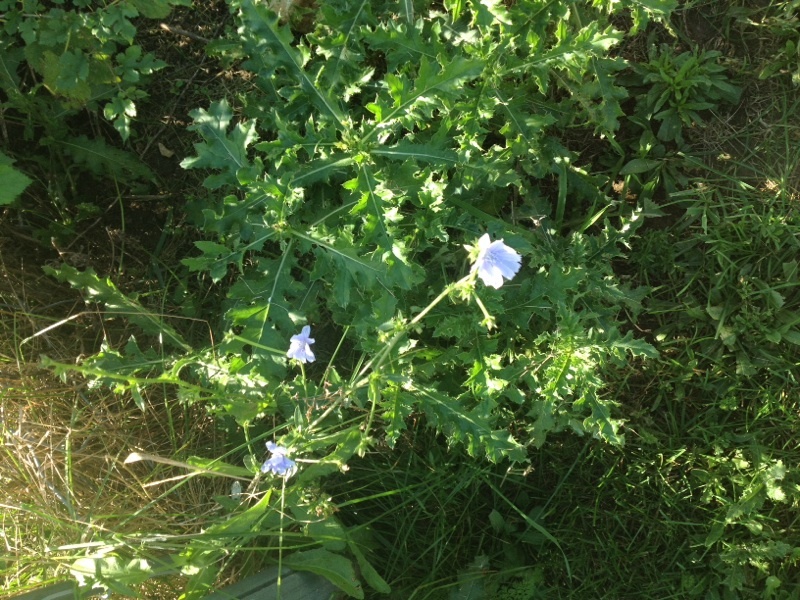 The non-native Common Chicory has been reported in nearly all areas of Illinois, except a few counties in the NW and SE sections of the state. It is quite possible that Common Chicory occurs in those counties as well. This plant originated from Eurasia, and was present in Illinois by the late 19th century. It has been spreading steadily ever since and has become common, particularly in disturbed open areas. Typical habitats include pastures, abandoned fields, areas along roadsides and railroads, grassy areas that are not mowed regularly, undeveloped real estate lots, and other waste areas. Occasionally, Common Chicory colonizes disturbed areas of natural habitats (e.g., early stages of a prairie restoration), but it is not a serious invader of such natural areas in the long run. The flowers attract short-tongued bees and probably other insects. Both nectar and pollen are available as floral rewards. The foliage of Common Chicory is eaten by Melanoplus bivittatus (Two-Striped Grasshopper), Melanoplus femurrubrum (Red-Legged Grasshopper), and probably other grasshoppers. The larvae of a lizard beetle, Acropteroxys gracilis, bore through the stems of this plant, while the caterpillars of the moth, Pyrrhia exprimens (Purple-Lined Sallow), feed on the the flowers, buds, and developing achenes. Because the foliage contains a bitter white latex, it is probably not preferred as a food source by mammalian herbivores, although cattle and sheep reportedly eat the basal leaves. 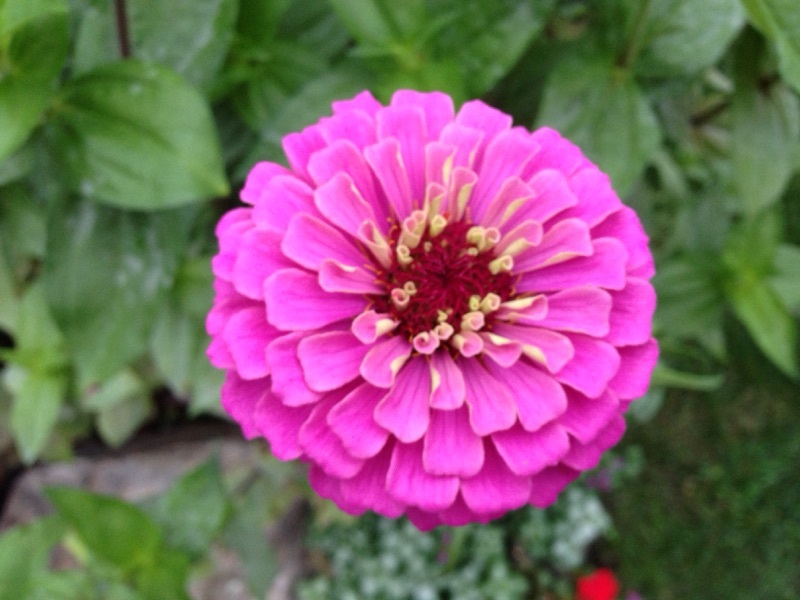 Zinnias are prone to two leaf diseases in the Northeast: powdery mildew and leaf spot fungus. They are difficult to impossible to prevent, but here are some ideas for you. 1. Do you grow your zinnias mainly for cutting flowers? If so, just ignore the mildew; it doesn't kill the plant and we strip the leaves off when we use zinnias in bouquets anyway. 2. 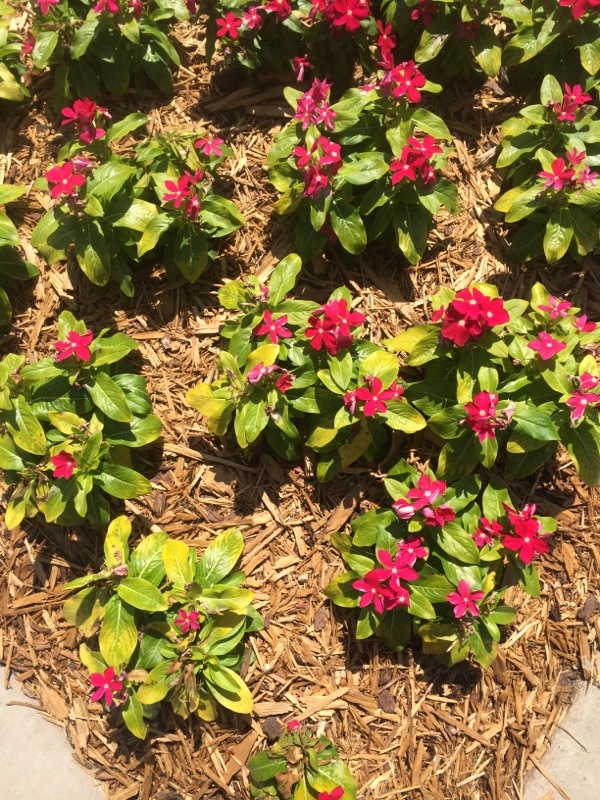 If you want zinnias for color in the landscape, try the Profusion series. These come in assorted colors, are lower growing and deadheading is optional. They don't have long stems for cutting, but are perfect in annual plantings or mixed in with perennials. 3. Be sure to water your zinnias deeply less often. These are plants that came from Mexico and Central America, so they are used to hot and dry. The worst way to water is frequently, by hand, as this doesn't soak down deeply enough to create strong root systems, and tends to dampen the leaves too often. Once a week with a sprinkler going at least an hour and a half is perfect in Northeastern gardens. Many of us agree that zinnias are must-grow flowers for the summer garden, so we hope this has been helpful. At this point, be proud that this plant is still alive! Actually, it's not looking that bad in that most of the stems are still green and alive. The plant has dropped leaves because these are the "food factories" and when there is little light from a combination of indoor conditions and fewer hours of daylight, the plant "lays off workers." If there isn't that much photosynthesis to be done, the plant drops leaves so that there is less moisture lost and less to maintain. Kind of like how garden centers lay off employees for the winter and re-hire in the spring. So what to do now? Keep doing what you've been doing in that this plant is still alive and biding it's time! 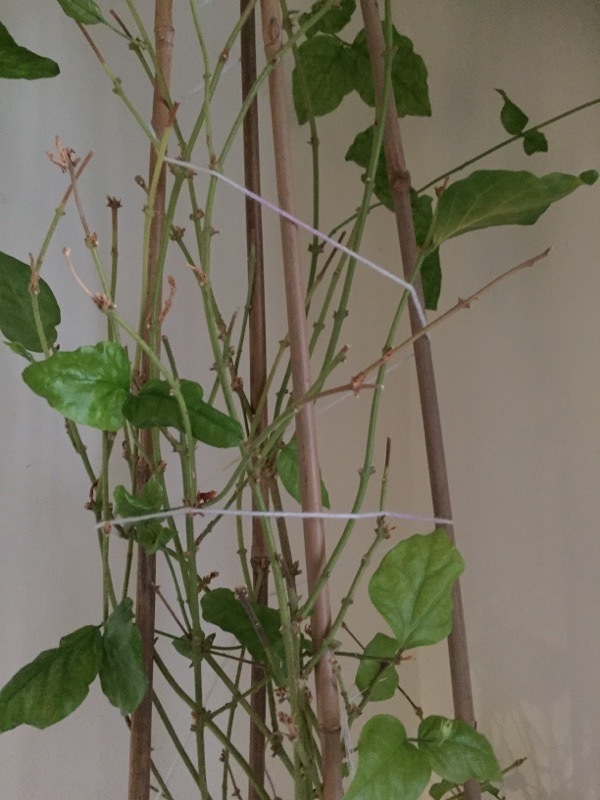 Clip off any brown or obviously dead twigs but leave any stems that are green. If the pot is less than 8" in diameter you'll want to consider upgrading the pot size and giving the plant some new soil when you put it out in late May. When you do put it back outside, place it in a shady spot first or a place where it only gets a couple of hours of morning sun. Start to fertilize it once it's back outside, and after a couple of weeks move it to where there is more light. Send us photos in mid-June, OK? We're willing to bet this plant will be full again by then, and we'd love to see what it looks like once it comes into flower. This could be insect damage from Thrips (singular or plural), but it doesn't really look like what we'd expect from them, so we're wondering if some kind of liquid was recently sprayed near these plants? The specs appear very tiny in your photo, like what we'd expect from very tiny droplets, or mist, falling on the leaves. We're leaning toward that (without being able to see the entire plant) because it appears from the photo that the specs are all on the upper leaves, and if on the lower leaves, only on those parts of the leaf that are not covered by leaves above them. This is commonly what we see when some mist from a sprayer has inadvertently landed on the leaves from above. If you know for certain that nothing like that has occured, then we suggest you keep an eye out for these same specs as the new leaves continue to grow and expand. 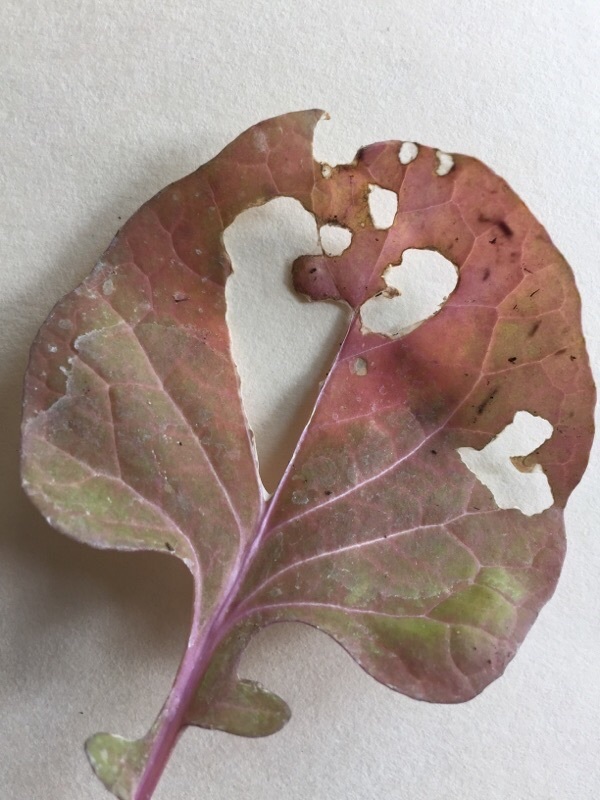 If you begin to see this same thing on those leaves, then you can be pretty sure its the Thrips. We've included a link about these insects for your reference. Be aware that these Thrips are very tiny (either black or yellow/gold) cigar-shaped insects that may or may not be seen by you (you usually just happen to come across them while inspecting plant parts). If you find anything on the underside of the leaves that corresponds with the specs on the upper side, please send us a new photo of what you find and we'll look at that. 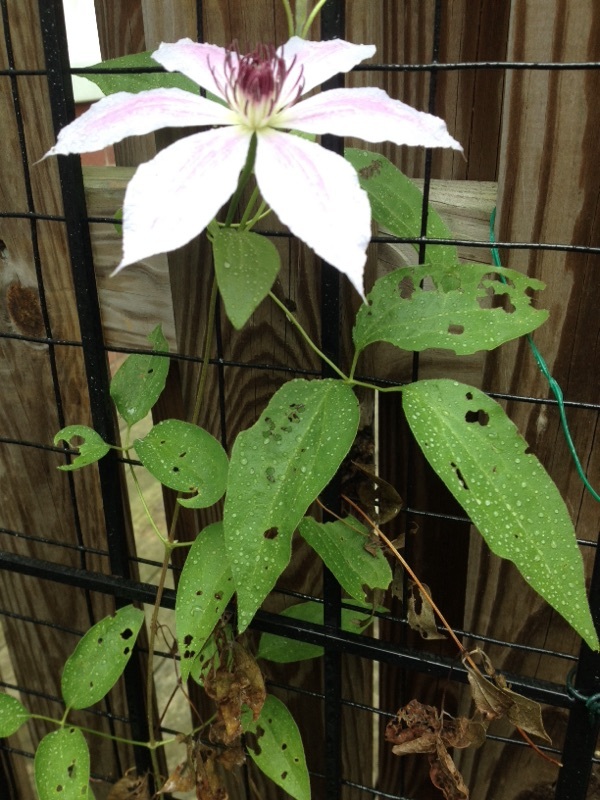 From the photo it appears there is be a nutrient deficiency - looks like a phosphorus deficiency. If the plant is growing "in-ground" deficiencies are usually not due to lack of nutrients in the soil (unless you used high amounts of soil amendments or organic matter that hasn't broken down yet), but often nutrient deficiency is caused by over or under-watering for the needs of the plant. Over-watering can cause the plant to produce vegetative growth rather than flowers, and underwatering is stressful for the plant and it may respond by not producing flowers if the plant is a flowering one. In water stressed situations, plant roots either begin to rot or dry out and therefore can't function sufficiently to absorb nutrients along with water and we see the deficiency in leaf tissues. We recommend watering more deeply and less frequently rather than providing smaller amounts more frequently. If the water does not soak into the soil quickly and begins to runoff before you can provide a sufficient amount, you can apply water until it just begins to runoff, let that water soak in, apply more again until just before runoff, let that soak in, and repeat this several times during one irrigation (in the same day). We recommend keeping the soil evenly moist, and avoiding fluctuations between dry and flooded soils to keep the fertilizer salts diluted in the moist soil. A slow release/time-release fertilizer is also recommended.